Make sure a client’s initial meeting doesn’t feel like a visit to the doctor’s office. For many people, those statements are true. Now think about how new clients feel during a first training session. They are meeting you for the first time, in an environment where they probably feel out of place. They are asking for help to create change by having you scrutinize their current beliefs and personal shortcomings. A first session has the potential to be the perfect storm of negative interactions. You are sailing in tricky waters, and if you don’t navigate skillfully, you may lose a client, create poor word of mouth and hurt your bottom line. So, how do you turn a first session into a long-term client relationship? The answer lies in a simple change in behavior. As a trainer, you are not selling workouts; you’re creating a positive experience at the gym. Your number-one goal is to have people leave smiling, not just sweaty. Starbucks® did not grow into the global leader in specialty coffee sales by grinding and brewing coffee beans. It focused on all the details that go into providing a positive customer experience, into creating a place people wanted to visit, and as a result sold a boatload of coffee. You need to turn a workout into an experience that clients look forward to, in an environment where they feel good. Clients do not stay with a trainer for years because they get great workouts that way; they stay because they feel connected. Before a first session, you need to have the mindset that your goal is to connect, not just to focus on the nuts and bolts of the workout. Connection does not happen magically, though. You need to set the intention in your own mind and have a plan to help you connect. I use a simple, powerful game called Coins that was developed by Steve Shenbaum, founder of Game On Media. “Coins” are the things in our life that make us smile. Since there is limited time in a session, I suggest staying away from the more obvious coins. For example, if I am working with a football player, I assume he loves football, just as I’m sure a mother of two loves her kids. Other things like jobs, academic majors or hometowns can also be obvious coins—but they don’t always indicate who the person really is. You want to get new clients to pull out their “rare” coins, the things they are passionate about but don’t always reveal. Discover these coins by asking open-ended questions such as “What is the last movie you saw?” “What music did you listen to on the way here?” “If money was no object, what job would you do for free?” and “If you could have just one hobby, what would it be?” True connection is a two-way street, so be ready to share some of your own rare coins. When you discover you have coins in common, you will really begin to connect. Takeaway. Go into a first session working to discover and trade “rare coins.” This strategy turns the environment from uncomfortable to comfortable and allows clients to open up and tackle some of their shortcomings. To help new clients feel comfortable, avoid making your first session like a doctor’s visit. No one wants to be pinched, measured and assessed like a lab rat. While good assessments are powerful and necessary tools, new exercisers generally don’t want to be weighed, measured and tested in an intimidating environment by a fit person they barely know. By assessing people right away, trainers send the message that results are measured only in weight, inches or number of push-ups completed in a minute. Takeaway. Instead of using traditional assessments during the first session, adopt a workout blueprint that has great assessment tools built into it. This way, you can get an idea of a client’s physical condition and gather the information you need to set up a program that will address his or her needs. Dynamic warm-up and drills. Athletic-style drills not only help clients warm up properly but also let you see how their bodies move in space. Drills can be simple or complex, moving or stationary, low or high intensity. They reveal movement abilities, right/left imbalances and coordination levels. Simple drills like skips, shuffles and backward runs will tell you a lot about how people move in different planes of motion. If clients are uncomfortable or have difficulty with these exercises, you can have them perform stationary drills, like three-way lunges or small foot-pattern drills, and get much of the same information. BOSU® Balance Trainer exercise. An unstable environment provides a good opportunity to observe overall stability, proprioceptive ability and neuromuscular communication. Asking new clients to stand on the BOSU (or stand on one leg) instantly gives you a good idea of what type and level of exercises will be appropriate for them. You can also incorporate exercises that involve shifting weight from one foot to the other; this will show you clients’ transitional balance, which will tell you the complexity level they are ready for in movement drills and other exercises. TRX® Suspension Trainer™ “unloaded” strength exercises. I always incorporate a squat, a lunge and a push-and-pull on the TRX Suspension Trainer in the first workout. By watching clients execute these movements, I can gauge their hip and ankle mobility, lunge mechanics, posture, core stability and body awareness/control. I use the TRX because it allows the body to move in space without extra load. It is safe, and I can quickly adjust the resistance according to the clients’ abilities. Right away I can see the areas that need to be addressed in the strength and stability program. And clients don’t leave feeling like a failure because they did only three push-ups in 60 seconds in a standard assessment! Takeaway. Use these three methods to give your clients effective workouts and provide you with detailed knowledge of their current physical abilities. Once you get to know their physical needs and limitations and have helped them choose goals that fit their true desires, you can build a personalized assessment and testing plan to measure and provide feedback. Most trainers are skilled at building a challenging and effective workout, but they may forget that during the first session the workout itself is secondary to how clients feel during and after the session. Turning first workouts into long-lasting relationships and repeat business takes more than an ability to make someone sweat. What brings clients back for a second session is not how many calories they burn—it’s the experience of feeling listened to, comfortable and successful. By taking the time to plan and create a positive training experience, you will connect and help more people, improve client retention and strengthen your bottom line. “Wanting to lose 20 pounds” is never a person’s real goal. What’s important is why the person wants to lose 20 pounds. Simon Sinek’s book, Start With Why: How Great Leaders Inspire Everyone to Take Action (Portfolio 2009), says that successful people are not driven by what they do or how they do it but by Why they do it. The Why is the driving force behind success, he argues. With your clients, this Why can provide consistency and direction for every action and help you develop a plan that your clients will believe in and will take action on to achieve. To discover a client’s Why, channel your inner Indiana Jones and start digging. Be prepared to ask many questions, as the Why is not usually easy to uncover. The client may tell you he or she wants to lose weight, but the Why is the important part—is it because his father just had a heart attack or because she gets out of breath when she tries to play tag with her kids? Is it because he needs to pass a physical to keep his job, or because she has always been the “bigger” sister and is finally ready for a change? Once you uncover a client’s Why, start simple with daily or weekly action items that help the client reach his or her ultimate goal. Huge achievements are the sum of small, daily endeavors. What one daily or weekly action would make life better? If the goal is to eat more healthfully, what simple action item would bring about success? How about planning dinners for the week so the client has healthy food in the house and doesn’t resort to fast food? When you discover the Why, it is easy to work backwards to create action items that will make change in the client’s life. Casey Stutzman is an ACE, AFAA & FMS certified trainer and has been actively involved in the fitness industry since 2004. He is the owner of the Performance Locker, a personal performance training studio in Alpena Michigan. Casey’s love of athletics and competition drove him in to the fitness industry. He uses his experience as a division 1 college football player, amateur bodybuilding competitor, strongman competitor & endurance athlete to help others reach their goals in all areas of fitness. Casey spends his time training clients and athletes to meet the challenges of life and sport. He has worked with and developed strength and conditioning programs & performance training for a number of local athletic organizations and teams. As an Ignite Performance Master trainer and Master Instructor for TRX Casey travels North America to educate and connect with fitness professionals to help them offer more to their clients and athletes. 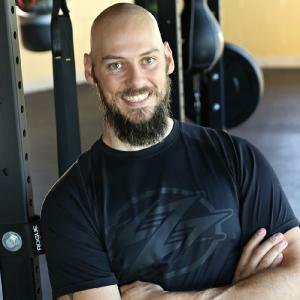 In 2012 he teamed up with Hedstrom Fitness to develop training methods and programming for the Surge & currently represents Surge and BOSU as a Master Trainer. Casey is an International presenter in the Fitness industry teaching a number of professional courses each month and has spoke at both IDEA World and Can Fit Pro. Time outside of fitness is occupied with reading, travel, indoor rock climbing, snow sports and being an active outdoorsman. He enjoys spending free time with his wife Mary Beth, his daughter Vesper, son Indiana and Turkish the family dog. You can connect with Casey at www.CaseyStutzman.com ... read more.